Once again I am forced to confront a noxious comment from a man who I would otherwise venerate. His name is Rav Yisroel Eliyahu Weintraub (R’ Elya). Why would I venerate him? Because of his tremendous Torah knowledge. His brilliance and Hasmadah - diligence in Torah study - earned him the Steipler Gaon as a Chavrusa - a study partner. He has also made significant contributions to the world of Torah study. His Hashkafic opinions are so well thought of in the Charedi world that he was often referred to by Rav Shach when asked what Daas Torah was on any given subject and told to follow whatever R' Elya said. That is what makes what he said so difficult. I hate criticizing such people. But I have no choice but to speak out and let the world know that not all religious Jews think this way. Rav Elya was recently asked to comment about a couple of events impacting on the Torah world. One of his opinions I actually agree with. Breifly there was a story going around about Rachel Emeinu ‘appearing’ 3 times during the recent war in Gaza and saving the lives of 3 different groups of soldiers. Although both Rav Ovadia Yosef and Rav Mordechai Eliyahu said it was definitely true, Rav Elya dismissed it as false. I agree - but not for the same reasons. "But what is wrong with it? .... Davening for a salvation is what we need to do... The problem is with the approach - that the yeshiva bochurim say, 'They are moser nefesh for us, so this is what we do for them." To make a partnership? To act as if there is a connection between our camp and the chiloni camp? That is treif! This type of a partnership means that the chareidi looks as if what he is doing is worth less than what the chiloni soldier is doing. And this denegrates the Torah. He then goes on to explain that even though they are indeed putting their lives on the line for their country, they do not really do it for the Torah world. He demonstrates that by saying if a religious Jew to were to ask a Chiloni soldier for even the smallest donation for a Yeshiva they wouldn’t give it. He then makes a Kal V’Chomer. If they won’t even give 20 shekel to a Torah cause we can easily assume they wouldn’t give up their lives for Torah Jews. I firmly believe that he is categorically wrong. 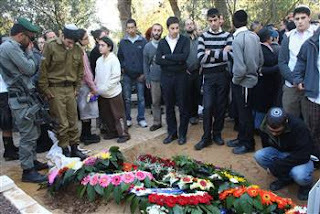 Most Chiloni Israeli soldiers would give up their lives for a religious Jew. That he will not support giving money to Yeshivos and Kollelim is an entirely unrelated matter. That a man of R’ Elya’s great brilliance and accomplishment doesn’t realize that is truly amazing. There is a difference between loving a fellow Jew and not approving of his lifestyle. Isn’t that in fact what we preach? Shouldn’t we embrace our fellow Jew even if we do not support his cause – especially if he is a Tinok She’Nishba? Would he say that a religious Jew would not risk up his life to save a Tinok SheNishbah Conservative Jew even though he would not give a penny to JTS? And who says that a Charedi doing so implies a concession that the fighting soldier has a greater merit than learning Torah? There is no such concession in doing that. It is just a way to show that the Torah world cares and is willing to do their part in ways that they can. That the Chiloni world does not accept Torah learning or prayer to be on the same level as fighting in Gaza is certainly understandable from their point of view. But it is certainly not the position of any Charedi – implied or real. What is worse is that even if you say he is entitled to his opinion - why is he saying things like this now? This is not going to make the Chiloni world any more Frum. It will only push them away further. You can daven for their salvation. They are tinokos shenishbu and not evil. Like that’s going to make them understand. Like that is going to console a bereaved mother of the loss of - or serious injury to her son. Does R’ Elya really believe that his comments build up Torah? How different is this from what R’ Chaim Shmulevitz said at a Seudas Hoda’ah when Mir Yeshiva was spared – nearly being hit by a rocket attack in 1967. It was right after the Six Day War (If I recall correctly). He graciously acknowledged the contributions of the Israeli Defense Forces. He too understood that learning Torah was important and said so. But he did not say anything about whose contributions were greater. He simply said that both contributed and he expressed his gratitude publicly to the Israeli army. How great were those rabbinic leaders! Too bad they are not role models for some of our current ones.